Yes, all of the above are inevitable, my friends. Each year of our marriage, just after we've received our tax refund, something has happened to one of our cars. Let's view the history, shall we? The week we received our check, the inevitable occurred. Gordita developed a crack that started growing at lightning speed from the left corner of the windshield. We took her in, got the windshield replaced. Eh, it could have been worse, right? 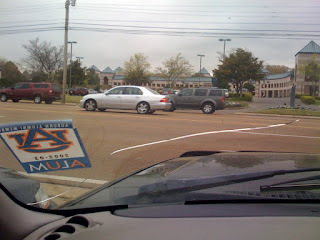 A week after getting Gordita's windshield replaced, I jumped in the Explorer to meet Nick for dinner after work. I had been running errands in Gordon just an hour earlier, had come home to finish up some work, and I was heading out again. Nothing out of the ordinary occurred during the errand-running. Nothing hit the windshield, no huge potholes, nothing. An hour later...the above picture on top (minus 2 inches). A 10-inch crack in an hour? Out of nowhere? A week after the same thing happened in our other car? Are you kidding me? The 2nd picture is from today (about a week later). Luckily, the original massively-growing crack has now only grown about 4 inches in a week. However, the windshield will eventually need to be replaced. And this means that instead of taking turns, our vehicles ganged up on us this year. I know, on the bright side, that I can count some lucky stars. At least the repairs became necessary just after we received a chunk of money. At least the repairs have been less costly than other larger problems--I mean, both of our cars are 12 years old, and the costly repairs we're paying for are new tires and new windshields? The transmissions are still hangin' in there, knock on wood! Just because things are inevitable doesn't make them any less of a bummer. But alas, at least our automobiles are predictable. Kind of. Um, what am I supposed to be looking at? Did a tree fall on your car? If so, probably happened b/c of the sticker. You guys are hilarious--I had to post the pics from my phone before I could add the text from them. I think you were seeing the pics sans post. It is good to see that you still have the explorer. I seems Matt and I didn't destroy it after stealing it at camp that one time. This just happened to us last week. Got our refund and then my car died, had to get it towed, and it needed a new battery! Yes, could have been much worse, but still a bummer! Also, check out Seth's crack in his Explorer. It's been there for years and just keeps growing. He refuses to pay money to fix it and it drives me CRAZY! Hey, all you peoples who get refunds need to turn your face up to the Lord in jolly thanksgiving...Los Kisers ALWAYS owe Uncle Sam. Being "self-employed" is so tricky... no matter how much we set aside to pay it seems like Uncle Sam is still hungry for more. 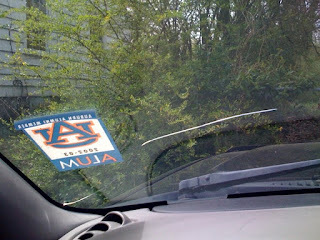 All that aside, I spend several minutes trying to figure out what "MUJA" stood for on your Auburn sticker. But then, because I have a master's degree, I was able to figure out that it is "ALUM" and I was seeing it backwards. Tricky, Jesse Faris, very tricky.